I recently acquired a Skynasaur. I don't know the model, I'm hoping someone can help me identify it and tell me a little about the kite. It is missing the upper spreader. I am guessing it should be 5mm diameter and approximately 440mm long; however, if someone has one they can measure, that would be helpful. The sail is signed. I can't decipher the signature, but below it reads: "93" World Cup. The lower spreader has a Skynasaur Hotrods brand on it. Posting a link to Google photos here. I guess it is a Trixter due to lack of the extended keel. That tidbit did lead me to this website which has some useful info and dimensions for Skynasaur. SKB is very knowledgeable, and yup -- looks like the Trixter. I have the Skynasaur Tracker, which is the sister kite of the Trixter, similar in most respects but with an extended keel which adds a little more sail area at the base of the spine. Assuming we have the right size (~74" wingspan), the Tracker upper spreader dimension may be of help. My Tracker is of .2100 pultruded carbon throughout the frame. I see from the printed guidebook that came with my kite that there was also a .2400 version for extra stiffness and a higher wind range. Can't speak to what the frame is on your Trixter but I would be inclined to go with the same diameter as the lower spreaders (alhough you could experiment with maybe a little less, which may or may not affect flying performance). 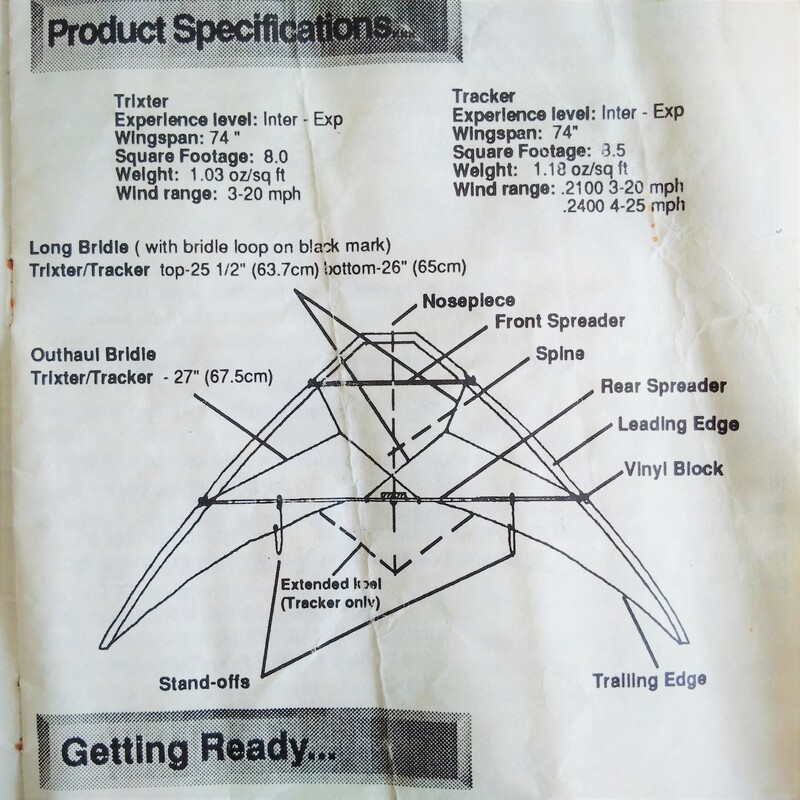 The upper spreader on my Tracker is 19 1/4 inches, or approx 490 mm long. The longer length than your guess promotes more of a curved leading edge. midibot - Thanks for the response. Yeah, I wasn't sure which direction the standoffs should bow. I don't have any other kites with standoffs that long. I used a caliper to measure the diameter of the lower spreader and it's 5mm. I'll setup the kite tomorrow and confirm the wingspan. I'm surprised the upper spreader would be that long (490mm). I'll see if that seems possible. Does your kite have the "93" World Cup signature also? Just wondering if that's on all Skynasaur's or if perhaps this particular kite has a history to it. I wonder why should the standoffs bow OUT? that would then tweak the trailing edge of the skin into a flap poking out of the back....in the configuration now the standoffs provide tension against the skin and leave the trailing edge in a much smoother shape. I agree. The standoffs are unusual. I also noticed the photo that seemed to show them angled towards the spine, not perpendicular to the lower spreader as is the usual case. The reason I thought they should bow in is because it looked like it would create less stress on the connection at the trailing edge. 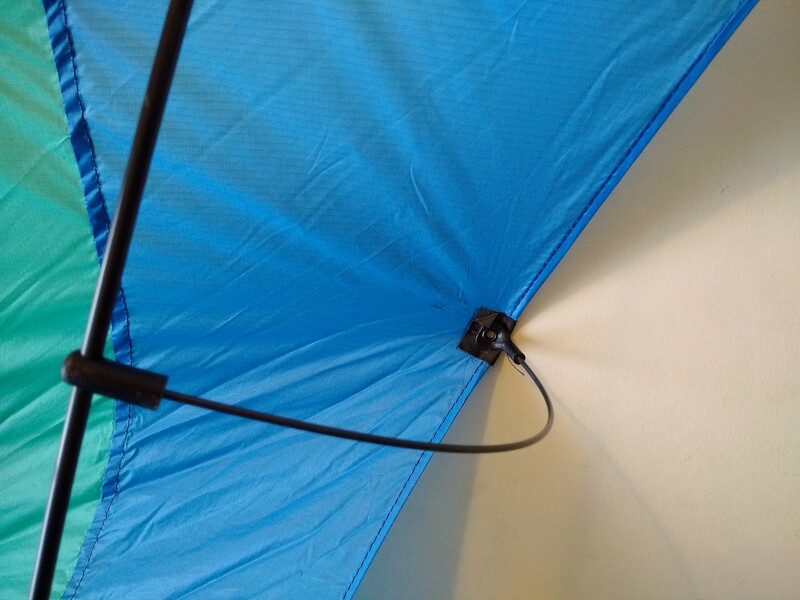 The only reasons I can think to have them bow out would be to possibly reduce line snags or to be able to pop the kite up if it was belly down. Yet another mystery. I'm hoping there's someone out there that knows. The diagram from midibot's booklet does show the standoffs bowed out and perpendicular to the lower spreader. So it seems that is what the designers intended. Here are some further thoughts and notes. Wingspan: My Tracker fully set up comes in at just under 76” (a bit larger than the 74” spec). At the risk of 1000 words which could be avoided by a closeup pic, which I will work on, the sail side standoff fittings on my Trackers are the older, kinda flat kind that point backwards, or away from the nose. (Modern kites are generally more straight up and down or perpendicular to the sail as you are aware.) When this standoff is assembled, the standoff rod (11”) wants to bow back (as opposed to forward) on my kite, as to do otherwise would put considerable strain on the sailside fitting in my experiment just now. (It does not rotate.) 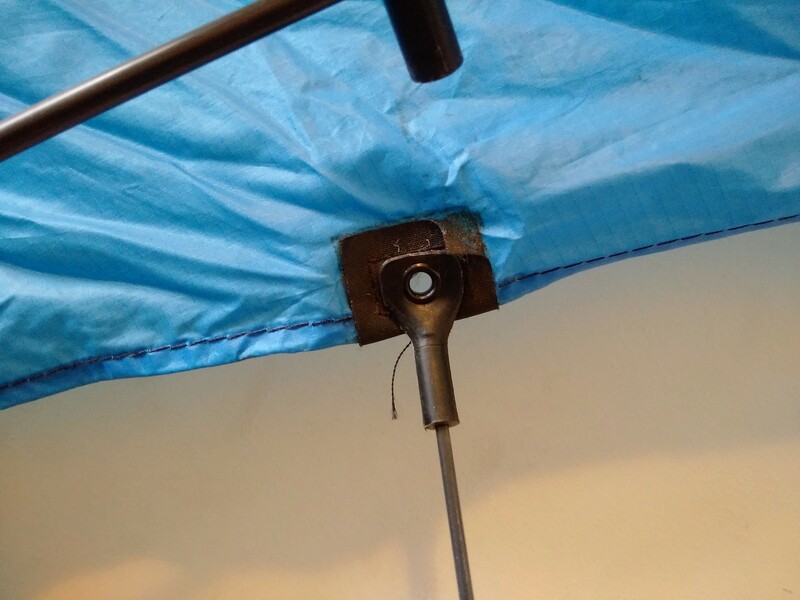 My sail when assembled with bow aimed back is flat -- no flap effect. There may be other types of sailside standoff fittings on other Skynasaurs (or where they have been replaced/upgraded) but this is the style used on both of my two Trackers, and, now that I think of it, my (larger) Tracer; just checked. So the diagram in the Skynasaur instruction sheet seems correct, at least for my kites. That instruction sheet is dated 1994, by the way. Spars: no marking on mine other than the centre T ferrule, which is A20 Glaspar (specs out with an .219 inside diameter on the Goodwinds site). My frame at .2100 translates out to about 5.33 mm; if yours are 5mm that would make for one down in the thickness gradient to about .196ish -- which would imply an even lighter frame, taking you even lower in wind range bottom end, potentially. That owner’s manual page doesn’t specify the size used in the Trixter, but I do note the stated wind range of 3-20mph, the same as the .2100 Tracker. Not familiar with (Skynasaur?) Hotrods but a google search indicates that the larger Tracer was available with Skyward “Hot Rods” by AFC in 2100 and 2400. For what that's worth. Signature: My kites have no signature, so yours is special. I am guessing that it might be Mike Simmons’ signature above the reference to the “93” World Cup. He was the designer of the Trixter, Tracker (and Tracer!). If so, very very nice. Some pics of a standoff on my Skynasaur Tracker. Yup, my standoffs look the same. I measured the tip to tip wingspan at 76" also. I reconfirmed that the brand on my lower spreader is "Skynasaur Hotrods". Perhaps my kite is slightly newer, probably after the sale of Skyward to Skynasaur. I remeasured the lower spreader as best I could. OD is 5mm (3/16 or .20 in). ID is approximately 3mm (2/16 or .10 in). If I have the lower spreader installed (and not the upper because it's missing), I measured about 17 inches between the upper spreader connectors. Maybe a 19 1/4 inch upper spreader will fit but it's going to be a tight fit. I will cut a spar to that length and give it a try. There was a reason for the longer upper spreader. To these eyes, it also just looks better, eh? It was fun digging out the kite. I learned some stuff. I also discovered that the stoppers for the connectors along the leading edge need to be recentred and glued. Likewise that for the centre T on the spine. I will also check the ones on the lower spreaders (“rear spreaders”) that locate the funky cross bridle setup (another innovation?). The bungees are also tired after 25 years. Mine flew great last time out with it in the fall. Quite precise yet easily turned within its wingtip and able to pop that axel. Be fun to fly the Trixter some day, too, down the line.